The Blackburn Mercury was an early British aircraft designed as a pilot trainer for the Blackburn Flying School, Filey, in 1911. It was an enlarged, two-seat version of the Second Monoplane that flew earlier that year. It was a mid-wing monoplane of conventional configuration that accommodated pilot and student in tandem, open cockpits. This prototype was displayed at the Olympia Aero Show in March 1911 and led to orders being placed for two racers to participate in the Daily Mail Circuit of Britain race. The first of these crashed on take-off, and the second was first rebuilt into a two-seat trainer, then into a single-seat trainer known as the Type B. Another six Mercuries were built for various private buyers. A full-scale non-flying replica of Mercury II configuration was constructed for the Yorkshire Television series Flambards and is now displayed at the Yorkshire Air Museum. "The Blackburn School Monoplane". Flight: 1048-51. 16 November 1912. http://www.flightglobal.com/pdfarchive/view/1912/1912%20-%201048.html. Retrieved 2009-02-23. Jackson, A.J. (1968). 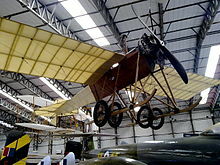 Blackburn Aircraft since 1909. London: Putnam. Taylor, Michael J. H. (1989). Jane's Encyclopedia of Aviation. London: Studio Editions. pp. 155. World Aircraft Information Files. London: Bright Star Publishing. pp. File 890 Sheet 31. Blackburn Mercury Pictures and Blackburn Mercury for Sale.